Battambang is a much quieter city than Phnom Penh, Cambodia’s Capital and a good little stopover, if you want to break the journey between Siem Reap and Phnom Penh. So, decided that a stopover in Battambang before heading onto the hustle and bustle of Phnom Penh would be a great idea. Along the way, you hear about the condition of roads in Cambodia, but you’re never really 100% sure if what you hear is correct. It’s always a nice surprise if you get to travel on a good road here. The Battambang Capitol Tour bus (US$8) left Siem Reap at 09:30 and is a good bus (always a bonus). This journey took about 3.5 hours on good roads with only a couple of stops along the way and a 20-minute meal stop. The only issue on this short journey was the bus stopped in front of the company’s office in Banteay Meanchey (almost 2 hours away) and everyone had to get off and wait for about half an hour. Another bus arrived across the road from the office and everyone started piling back on, only to be told it was the wrong bus. After waiting another 5 minutes, the bus we were on previously arrived, then we were all shunted onto the bus once more for the rest of the journey to Battambang. Lucky, as our luggage was on this bus – all a tad confusing. Although there are sites such as Wats, temples, killing caves, bamboo railway, and a couple of other things to do, didn’t do much sight-seeing here as decided just to relax…again (and save some money). It’s great just walking around this city and stopping off at coffee shops to chat with locals or chill…sometimes it’s cool just to sit, rest, and absorb the world whizzing by around you! Take a stroll down to the riverfront and you’ll come across French colonial buildings from the early 20th-century; a legacy of French colonisation. Another legacy of the French in Cambodia is the excellent baguettes and bread in general – just as in Laos, the bread here is wonderful! Nary Kitchen (No. 650 Group 32, Prekmohatep for US$10) runs traditional cooking classes with Took as our instructor, which is fantastic value at USD$10/person. The course included a half-hour or so at the local markets buying menu ingredients and Took explaining everything to our group of 4 students; lucky to have such a small number, which I believe is because it’s the low season. Took is a great teacher and makes instructions exceptionally easy to follow. The four Khmer recipes that we made were absolutely delicious and very authentic, which included the scrumptious traditional (Snake Fish) Amok! Sovannphum Hotel (Street 159D (East Sangke river), Romcheck 5 Village | Ratanak Commune) – Everything about this hotel is very good, very clean, new’ish, great room, and the service is good. However, although advertised with wi-fi in each room and public areas, the wi-fi was flakey first night, then nothing for our 3-day stay. This would not be fixed for 6-7 days as the holidays (Water and Independence Day combined) were on, which meant many things were closed for a week! As we needed wi-fi for writing and onward bookings, decided to move to the Asia Hotel. Asia Hotel (Street Lar A, Preakmohatep Village, Sangkat Svay Por) – Great staff! Although this is the older part of the hotel, it has been renovated so clean and functional. Fridge in room and wi-fi worked well; comfy bed. Great location to everything in town and the best thing about this hotel is the great and friendly staff…they deserve a raise as they are always smiling and very helpful! Kinyei (1 1/2 Street) – Loved the coffee, good breakfast, great shakes, and great welcoming service. These guys make their coffees with passion! You can do cycle tours from here also. 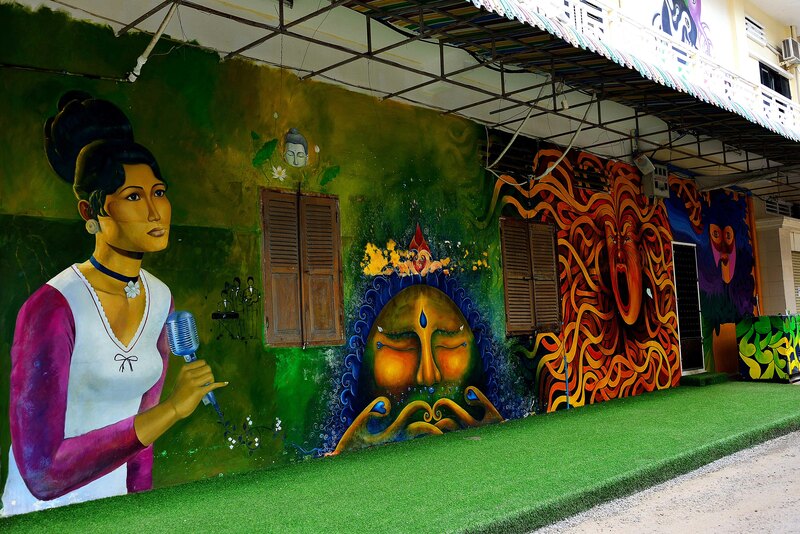 Jaan Bai Restaurant (Corner 2 Street and 1 1/2 Street, near Psar Nat) – Good coffee and delicious food. Try the mushroom and eggplant dumplings served with a delicious sauce – scrumptious! The hand cut chips are great. Service here is excellent from the friendly staff. Lovely ambiance, tasteful surrounds. Nary Kitchen (No. 650 Group 32, Prekmohatep) – Excellent food and great service! The success of the cooking class with Nary Kitchen made us return the next night (our last night) for dinner at the restaurant. The Banana shake and the food were excellent – very delicious! Prices are comparable with most restaurants in Battambang (we stayed in this city 5 nights so tried many places). The Capitol Tour bus (USD$8.75) leaves Battambang for Phnom Penh almost on every hour. Decided on the 09:00 Hrs bus as it’s about a 5-hour journey and want to arrive at a reasonable time. In 2004, I did this similar journey by bus and this time, I did notice a huge reduction in trees – it’s a stark difference and very sad. As expected, Phnom Penh has expanded in the last 10 years and spread even further into outer suburbs. This is noticeable the closer the bus travels to the city; and as a city with more than 2 million people now, it’s understandable. You can expect a mixture of wonderful Cambodian hospitality, Asian exotica, and Indochinese lure awaiting you in Phnom Penh. There’s not much to see along the 5-hour journey from Battambang to Phnom Penh. This city seems cleaner than I remember. This wouldn’t be hard as back in 2004, the city was experiencing a garbage collection strike as workers’ demanded a higher pay. The city’s streets were lined and piled-high with smouldering stinky garbage mounds; rats were having their field day amongst the garbage, which could be smelt for miles. Thinking this was the norm here as other countries in SE Asia were pretty dirty back then, I only learnt during a conversation with a local that the strike was on, which had been going for almost 2 weeks. 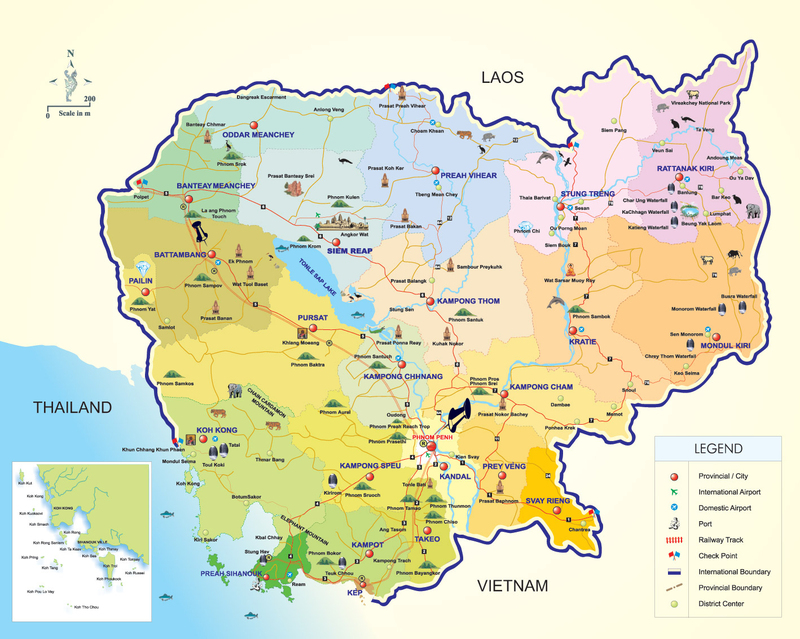 The city is situated at the confluence of three great rivers – known as the Chaktomuk (four faces) of the Mekong, Tonle Sap and Bassac rivers. The riverfront is lined with many upmarket restaurants and hotels now, not so before; only a few rundown restaurants existed. I remember a Pizza place on the riverfront serving up “Happy Pizzas” – drugs were not hard to come by. Another riverfront dining memory is of ordering a chicken dish and leaving it after one mouthful as I was certain it was not chicken but perhaps dog? As with most major capital cities in SE Asia, there are always many sites to visit if you have the time and money. The Royal Palace and the National Museum of Cambodia are quite impressive buildings but as I visited in 2004, didn’t bother this time. This museum on Street 113, Boeng Keng Kang, Phnom Penh 3, records the Cambodian genocide and is the site of a former high school, which was used as the infamous Security Prison 21 (S-21) by the Khmer Rouge regime (1975-1979). 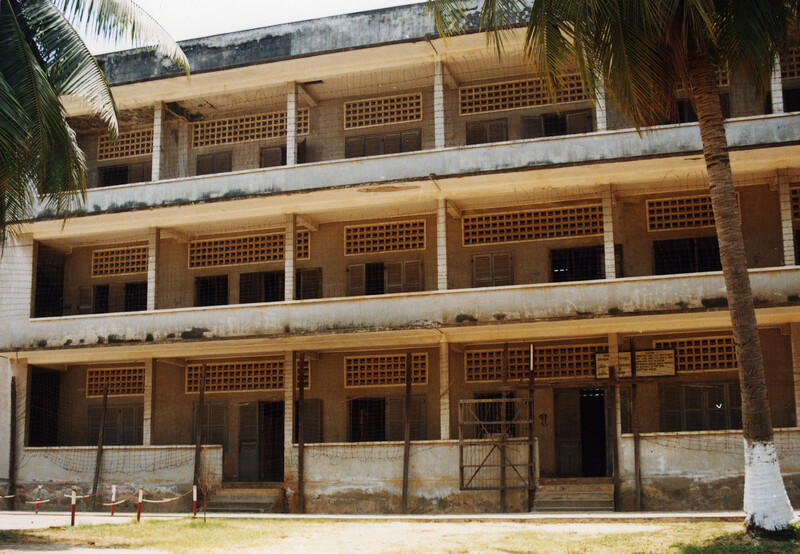 With as many as 20,000 prisoners killed here, Tuol Sleng was only one of at least 150 execution centres in Cambodia. I did visit this museum in 2004 and back then, it wasn’t a popular destination at all. Today, this has changed and resembles more of a money-churning machine (USD$3 entry + extra for a guide). Tour buses arrive with loads of tourists and loud-speaking guides on microphones. This is supposed to be a quiet place with ‘don’t shout’ signs displayed everywhere. Sadly, I don’t believe the locals treat this place with respect (shouting, using mobiles, eating, laughing, and carrying on). Young children especially, don’t understand the atrocities during the horrific reign of the Khmer Rouge. Although I did see a few older women going through the exhibits and crying, this was very emotional. Foreigners do seem to respect this site. 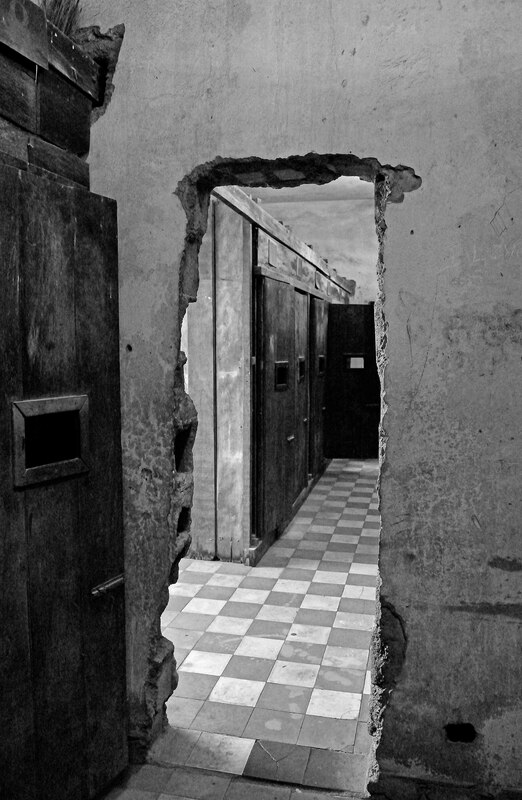 The sheer number of tourists (local and foreigners) takes away from the impact I felt the first time I visited, when there were only a handful of tourists during the 2 hours I was at Tuol Sleng. As with most things in Cambodia, it’s not about the experience or preserving a precious site, it’s about how much money can be made quickly. Also, the documentary movie that’s supposed to show daily was advertised as only showing 2 days per week but when I asked, it wasn’t showing at all. You can pay for a tour that takes in Tuol Sleng and the Killing Fields but I had no interest in seeing the killing fields. I believe you can also do most sites independently for a fraction of the cost, if you have the time. The actual market building between Streets 126 and 136, is Art Deco 1930’s architecture and a lot cleaner than in 2004. Very organised also, especially for a Cambodian market. You can buy almost anything here (clothes, jewellery, gems, souvenirs, and much more), but bargain hard as they’re used to tourists. It is an easy walk to the riverfront from here and you don’t need a tuk-tuk. If you want to buy tacky souvenirs, then this is the market for you. This is primarily a tourist market and sadly (as a foodaholic), not much food on offer, which is bizarre for Cambodia. You can buy loads of cheap designer clothes (seconds) here as many of the big brands have their factories in Phnom Penh, which says it all really, doesn’t it? Yolanda Hotel (No. 08, Street 209, Sangkat Tomnop Teak, Khan Chamkamon) – Excellent value-for-money; new hotel, friendly staff, and grand foyer! Very clean good sized-room; very comfortable bed; fridge, tea/coffee-making facilities; toiletries, great hot shower, and room serviced daily. Wi-fi worked, except on our last day/night. This hotel receives large tour buses staying for 1 night and as we stayed 5 nights, we experienced their noise. The first night was the best sleep (no buses) and we got to sleep in until 9 am. The 2nd day, the tour buses arrived and for the next 4 mornings we were woken up at 6-6:30 am with people talking loudly, bags being wheeled across the tiles, and generally making loud noises (it was the same at night but they were generally asleep by 10 pm). When the buses are in, the hotel puts on a buffet breakfast, which is great – a lot of selection and you can also have eggs cooked by the chef in front of you. Otherwise, you have a choice of eggs, toast, and tea/coffee (still a good breakfast). The hotel is a USD$3 tuk-tuk ride to the Central Markets; you can walk to the riverfront from the markets. After dark the price goes up to around USD$5. 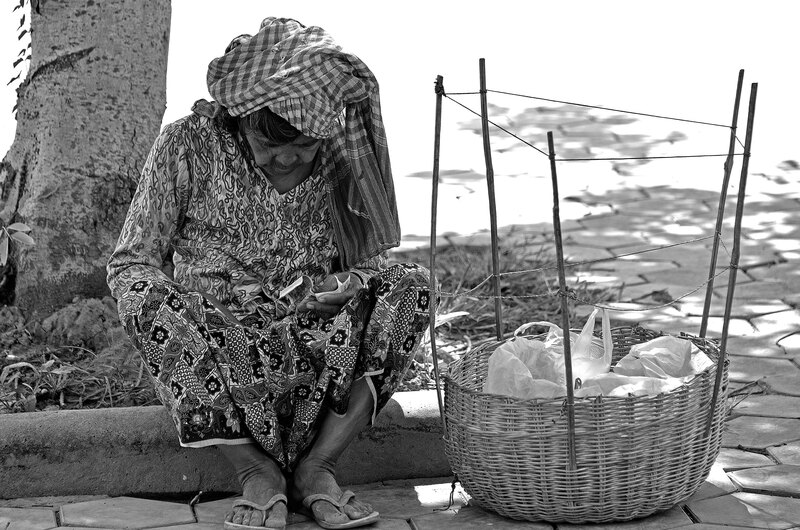 The hotel is about a 2 kilometre walk to Tuol Sleng and the Russian Markets. As the month in Cambodia is drawing to a close and with Vietnam as the next major destination for a couple of months, decided to head south once more and onto Kampot. 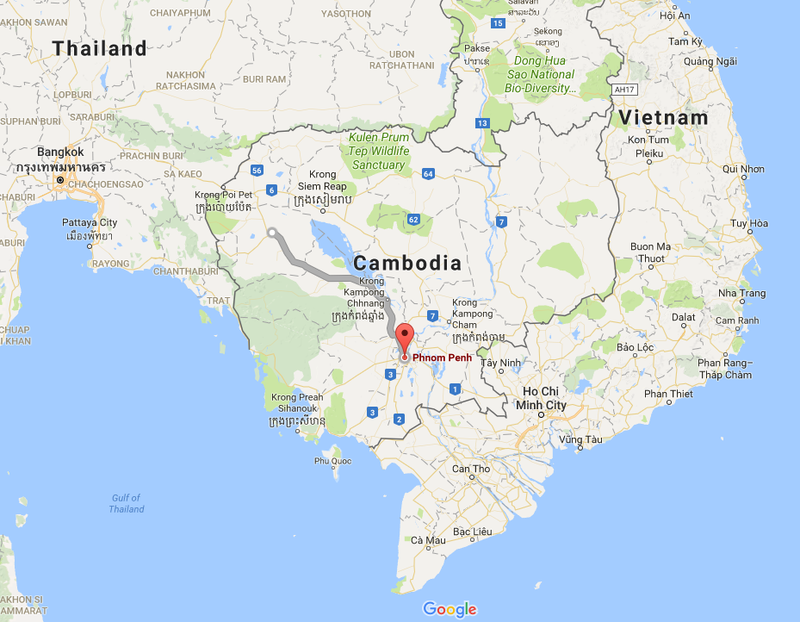 Travelling across the border and into Vietnam isn’t supposed to be a problem from this part of Cambodia. You must have your visa before going into Vietnam as this country does not allow Visas on arrival. So, bought a 3-month visa in Savannakhet (Laos).